About CRN and our unique way of providing debt relief. Hi there! I am Michael, and I founded Consumer Recovery Network along with 2 friends and dedicated debt coaches, Dean and Dayna, back in 2004. I want to share more about the unique approach to coaching and helping people through debt and credit problems we set out with back then, and that continues today. 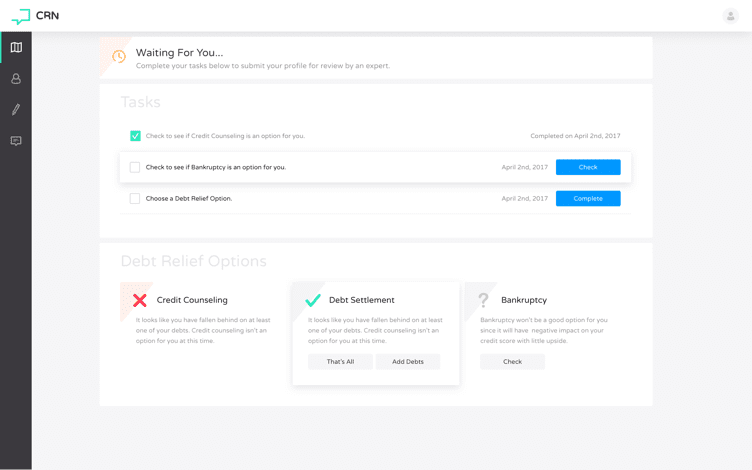 Credible debt coaching, where you get expert guidance in order to navigate a tough financial patch, was not commonly available to people when we started CRN and launched this site. There was only one other operation doing the stuff we envisioned at the time (we did not know the other guy then, but he later became, and remains, a good friend and associate). More than a decade later there is still a terrible lack of experts available to coach people through unfamiliar territory when negotiating with banks and debt collectors (of all variety and size). And there is no other company that offers DIY debt relief education and coaching while also providing expert debt negotiation services to those who want or need it. The intentions of CRN, and this website, can be best spelled out like this… we figure that if you knew what we know about resolving debt and credit challenges, you could solve your problems yourself and save a bunch of money in fees (some debt relief companies charge a lot). This simple concept is the foundation of what we do daily with site visitors; how we handle free telephone consults; and the one on one debt coaching we do with customers. I have personally helped thousands of people to overcome mountains of debt, and to achieve financial goals. I look forward to exchanging comments with you here on the site, and to speaking with you should you request a consult.